12 Days of Diabadass: Celebrating 12 months of diabadass in 12 days! PRO-TIP: Subscribe to our mailing list - we'll send out discount codes via email during these 12 Days of Diabadass, so keep your eyes peeled! Join the fun! 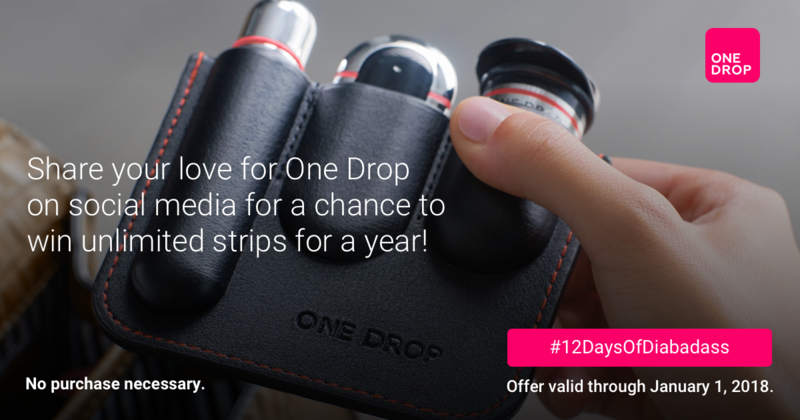 All you have to do is share your love for your One Drop app, meter, coach, or test strips. Show us your smiling face, use the #12DaysOfDiabadass hashtag, and tag One Drop. Once you've shared, you'll also be entered into our contest to win a Premium annual subscription. Then, on January 2nd, we'll announce our five special winners and share some of our favorite #12DaysOfDiabadass moments!